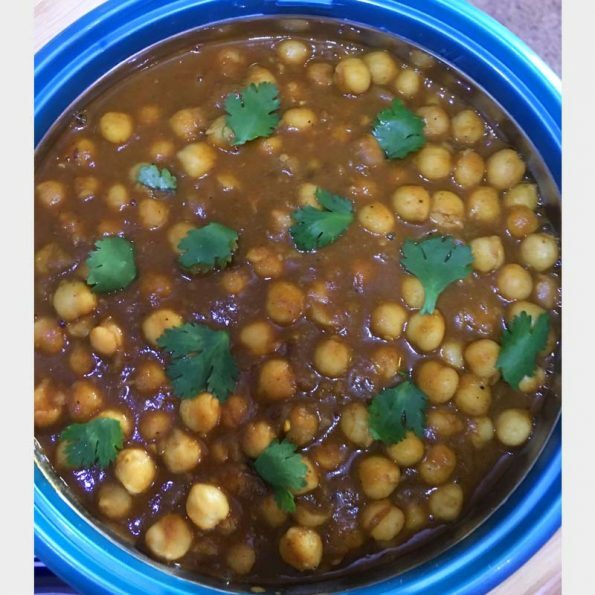 This is the best chana masala recipe ever, which I tried after enjoying it from one of my friend’s home. 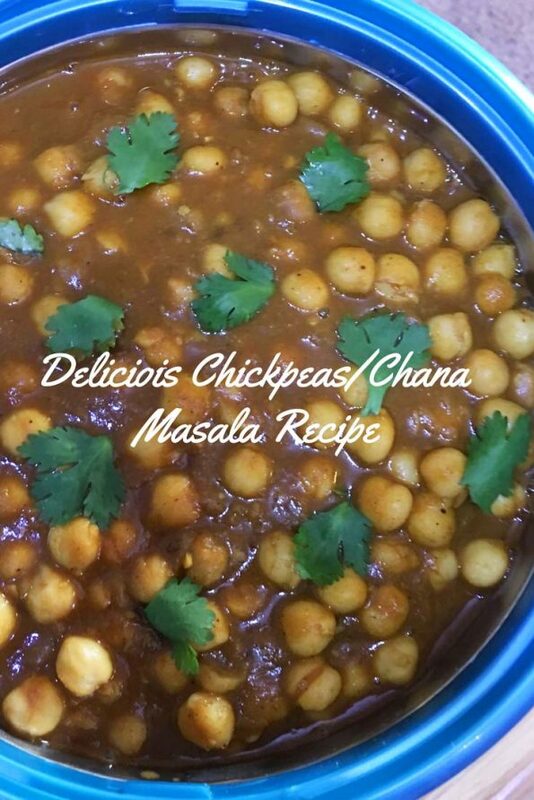 I have tried quite a few different versions of chana msala recipes before, while they are all good, this is the best chana masala recipe I know. 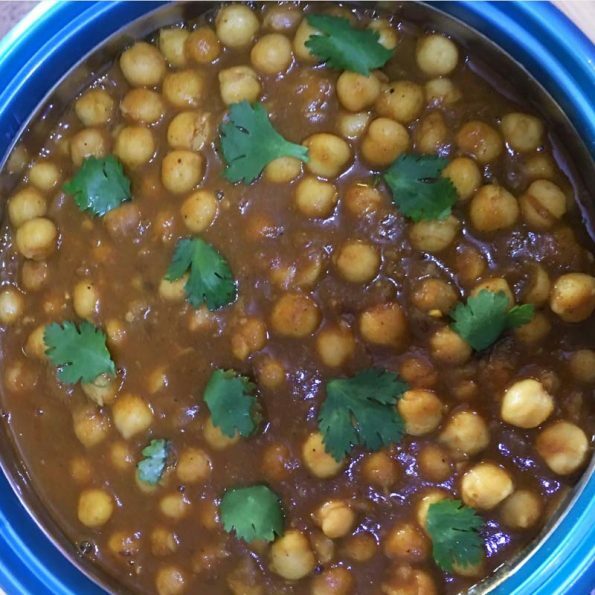 My friend gave me tips on how to make this chana masala, which I adapted and made my own modifications based on what I had in hand and based on my convenience. I am so happy I tried this dish as it was a hit. Even my kids who are picky eaters loved this and I took this for a potluck party where my friends asked for the recipe. Thanks to my friend for guiding me in preparing this simple, healthy and delicious chana masala following this best chana masala recipe. The combination of sauteed onion paste, tomato mix and exotic spices can’t go wrong with the gravy and when combined with soft cooked chickpeas, this makes a very delicious chickpeas curry perfect to be used with chapathi, batura, rice, nan, dosa, idli etc. 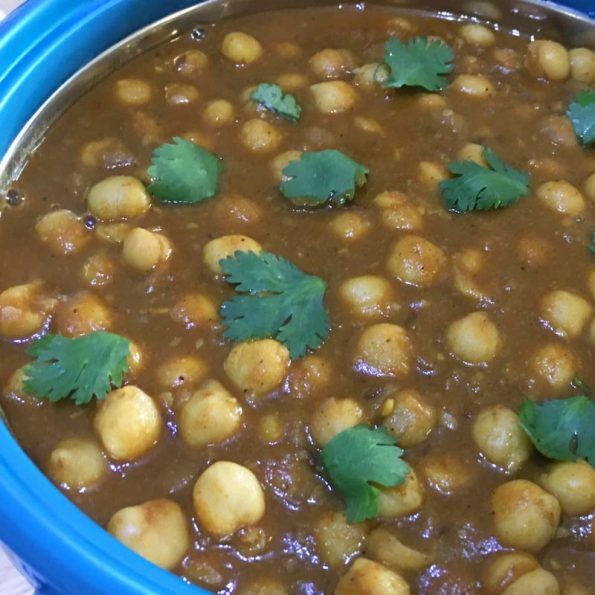 As I mentioned above, this chana masala curry recipe to make chana masala gravy is quite lengthy, but it is easy to follow and very worth the effort once prepared. So don’t get turned off by the lengthy instructions, you may even cook the chickpeas and make the onion mixture the day before to save time if needed. If you are cooking the chickpeas and making the onion mixture one day before making the curry, you should store them in containers in refrigerator until you use them in cooking the next day. In Kerala, chickpeas is usually prepared with coconut milk gravy or roasted coconut blend with spices as the base for the curry which goes well with breakfast items like appam, puttu or you can also enjoy it with rice as well. This chickpea curry popularly known as chana masala in North India is usually enjoyed with chapathi or poori and when it is served with bhatura the dish is known as chole bhatura (bhatura and chana masala). It is the perfect combination for a delicious North Indian style breakfast and I have enjoyed it many times from some friends of mine as well as restaurants. And now I prepare it at my own home as well. Trust me, this chana masala is the best homemade chana masala ever and it is way better than the ones you get in restaurants. And the recipe is easy to follow and I will explain the method of preparation step by step so you can easily follow the steps and make it at your own home easily. We use tomato paste to make this chana masala, but if you don’t have tomato paste, you can substitute with fresh tomatoes which is grind well in a food processor. My friend told me she adds jaggery to balance out the sourness of tomatoes, I added little sugar instead, as I didn’t have the jaggery. 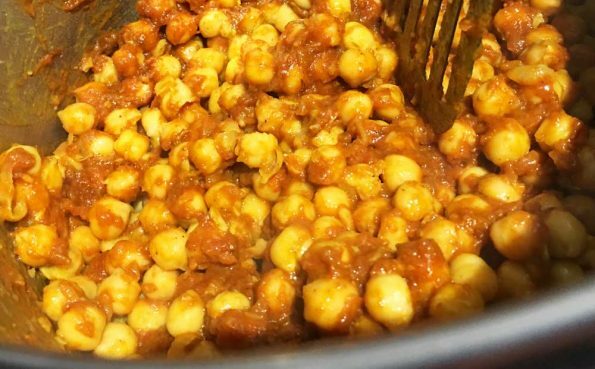 So here is how I made this delcious chana masala for chapathi (or poori or rice), following this best chana masala recipe ever. 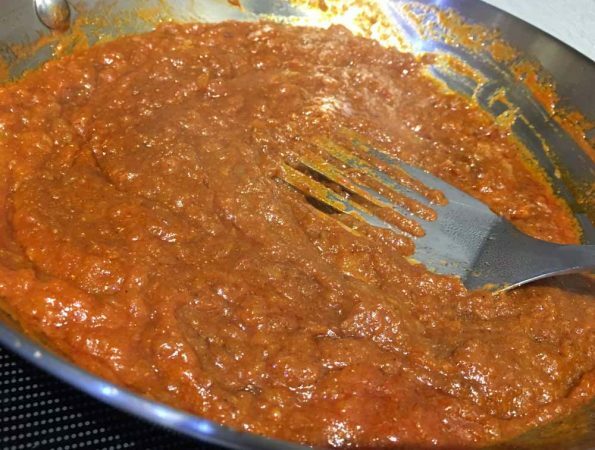 You may buy tomato paste online from here and also the garam masala powder from here to prepare the chana masala if you wish. Indian chana masala or chickpeas masala (garbanzo beans) using onion tomato gravy and spices makes an absolutely delicious chickpea masala which can be enjoyed with rice or Indian flatbread like chapathi, poori, dosa etc. Wash the chickpeas and soak in water in a large vessel (chickpeas will double in size with soaking) for about 8 to 10 hours or overnight for best results. If you are using canned chickpeas, you can skip this step. After soaking, you can drain the water and lightly rinse the chickpeas again. Transfer the soaked chickpeas to the pressure cooker and add enough salt and water, close the lid and cook in medium heat for about 12 to 14 minutes or about 3 to 4 whistles. Make sure to use the safety valve and follow the directions in the manual as this is important for your safety while using pressure cooker. After 12 t 14 minutes of cooking, switch off the stove and wait for the pressure cooker to cool down. Meanwhile peel and slice the onion finely. Heat a pan, add some oil and start sauteing the sliced onion. Add enough salt and saute the onion until they are transparent or starting to brown, no need to caramelize the onion. In a food processor, grind the sauteed onion to make onion paste. You don't have to grind the onion until smooth, as small pieces are very much fine. Keep the onion paste aside in a bowl. Now heat the oil (for seasoning) in a pan and add cumin seeds. When the cumin seeds are lightly fried, add the tomato paste and saute for about a minute in very low heat. 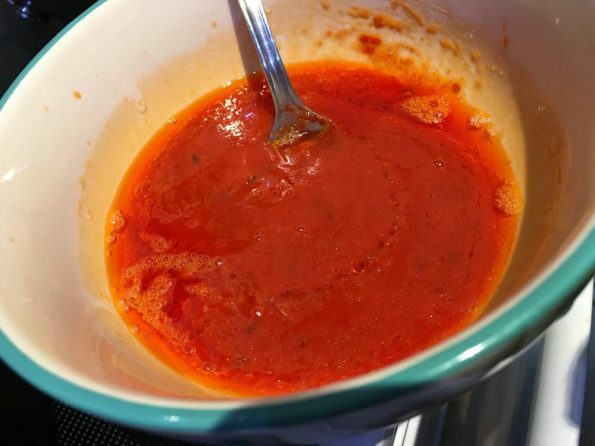 Transfer this sauteed tomato paste to a ceramic or steel bowl (which can handle the hot oil, if you use plastic, it may melt) and keep it aside. When the pressure cooker is cooled, open the lid and see if the chickpeas is cooked and soft. 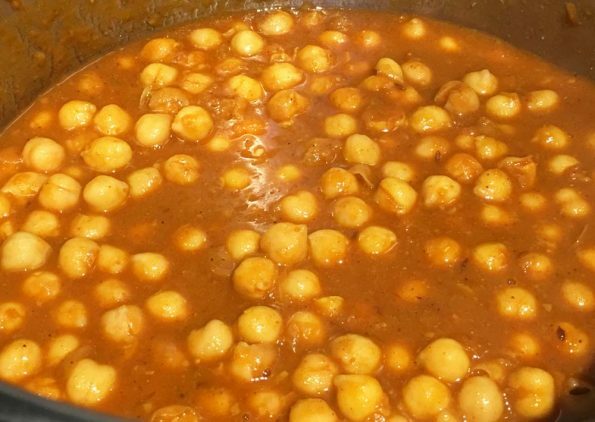 We really don't need all the water used to cook the chickpeas, but we need some of it to make the gravy of the chana masala. So drain the water using a drainer but don't discard the water but save it in a different bowl large enough to hold the water. Let us call this the chickpeas broth for easy reference. Be cautious if the water is hot, or you can even wait until the water is cold enough to be safe. Now we have the dry cooked chickpeas in the cooker and the water used to cook the chickpeas in another bowl. Add some chickpeas broth to the sauteed tomato paste to make it more liquid like consistency ( 3 to 4 tablespoons of broth is enough). And we also have sauteed onion paste and tomato paste in separate bowls. Now heat a large sized pan (you can also use the one used for sauteing tomato paste but it should be large enough to hold the chickpeas) and add the tomato paste mixed with broth and onion paste. Mix well. Add ginger garlic paste to this tomato onion mixture and saute the mixture for another 1 minute until well combined. 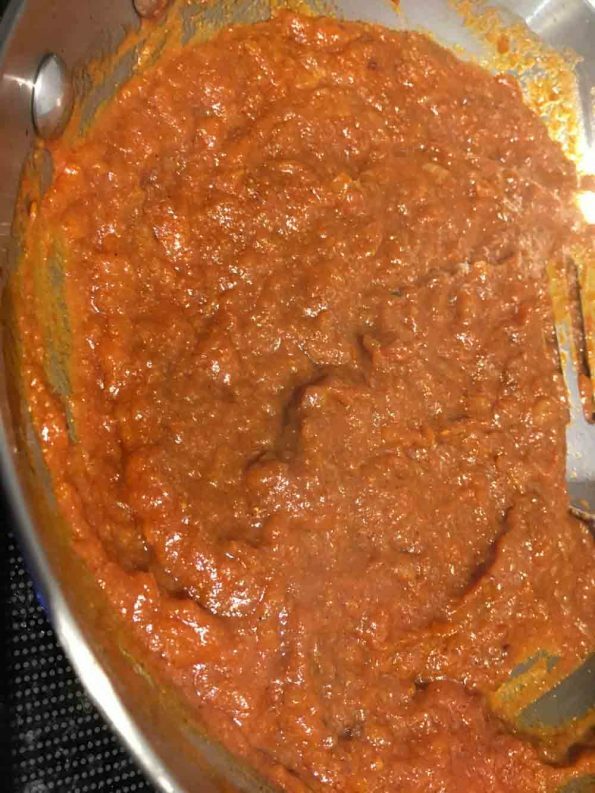 (we have salt in cooked chickpeas and onion mixture, no need to add extra salt as the tomato paste is sour. You can add salt if needed towards the end of the preparation, if needed). Add the jaggery or sugar to the tomato onion mixture to balance out the sourness. This step is very important as the chana masala will turn out too sour otherwise. After adding the sugar, mix well until until dissolved and then taste a bit (by taking a bit in spoon and wait until its cooled). If you think its still too sour, you can add a bit more sugar but don't add too much sugar as we don't want the chana masala to be sweet. Now add the spices - you can add all the spices to the mixture and mix well and saute until everything is well blended. Add the cooked chickpeas to the mixture and mix well until the chickpeas is coated well with the tomato onion mixture in spices. You can saute this for another 1 to 2 minutes. Add 2 to 3 cups of chickpeas of broth to the pan to make the gravy. 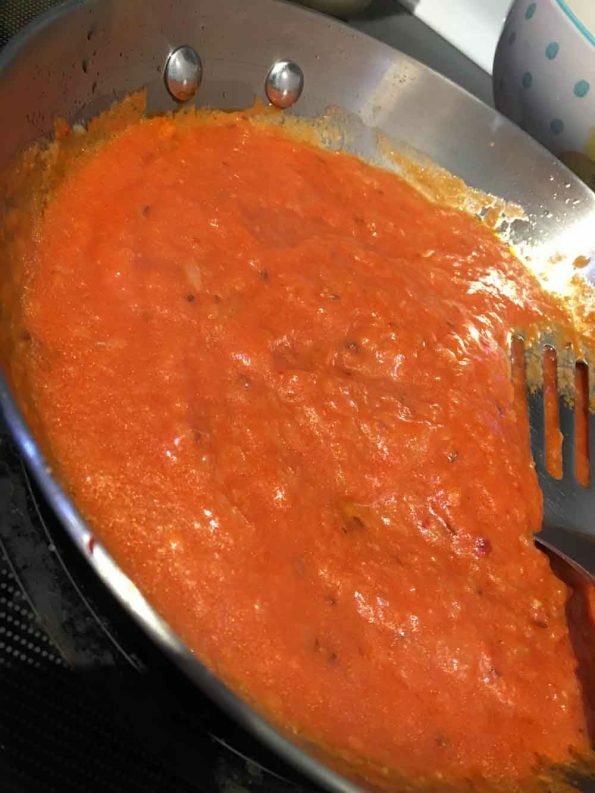 Mix everything well and heat so that the gravy is well blended with the chickpeas and spices in tomato onion mixture. Now you have the perfect chana masala gravy ready with the gravy made from tomato onion mixture combined with spices and chickpeas broth. If you prefer more gravy for the chana masala, you can add little more of the chickpeas broth. Garnish the chana masala curry with fresh cilantro leaves. Your chana masala gravy or Indian chickpeas curry for chapathi is ready to be used! Serve the hot chana masala gravy with chapathi, poori, bhatura, rice or even idli or dosa or appam or puttu and enjoy! 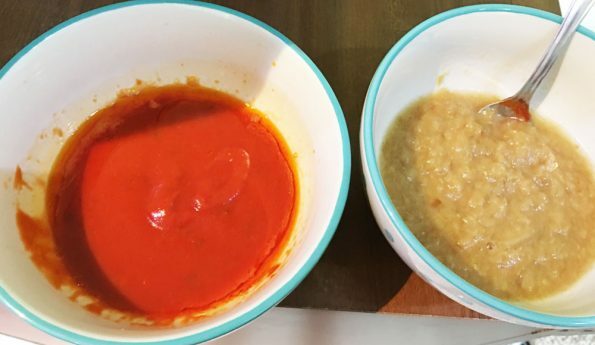 The below pictures shows the mixing of tomato paste and also the onion paste (the second photo shows tomato paste mixture in one bowl and onion paste in another bowl) and the making of gravy and also the preparation of chana masala using the prepared gravy and chickpeas. Hope you found this post on best chana masala recipe for chapathi, batura, puri, rice, idli or dosa helpful!